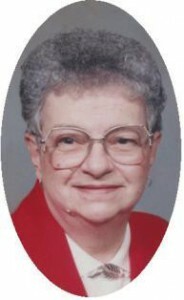 Mary Ellen Husting, 78, of Ellen’s Home in Port Washington and formerly of Maple Crest Apartments Port Washington died at her residence Saturday morning April 25, 2009. She was born March 29, 1931 in Milwaukee Wisconsin to Raymond and Helen Bink Eichenseer. She grew up in Port Washington and graduated from Port Washington High School. On August 29, 1953 she married Oliver “Ollie” Husting at St. Mary’s Church in Port Washington. She raised a family and also worked for over 20 years at Port Abstract & Title Co. in Port Washingtonas a secretary. She was a member of St. Mary’s Parish in Port Washington and enjoyed knitting. Mary Ellen enjoyed spending time with her family, especially takling trips to Crivitz, Wisconsin with her husband. In 2004 they moved to the Maple Crest Apartments from their West Grand Avenue Home. Her husband Ollie preceded her in death on October 5, 2004. In August 2008 she moved to Ellen’s Home. She is survived by 3 children, Debbie (Tom) Morgan, Bob (Carole) Husting both of Port Washington and Michael (Denise) Husting of Saukville and grandchildren Joel Morgan, Jenny (Kevin) Riley, Katie, Julie, Christopher and Mikayla Husting. Further survived by brothers-in-law Harold (Barbara) Husting of Venice, Florida, Gerald (Marie) Husting of Crivitz, Wisconsin and Ronald (Marilyn) Husting of Muskego, Wisconsin, sisters-in-law Florence Jaeger of Port Washington, Joyce Zignego of the Town of Erin, Wisconsin and Judy Eichenseer of Las Vegas, Nevada, other relatives and friends. Preceded in death by her husband Ollie, brother Bill Eichenseer and sisters-in-law Mary Basken and Esther Husting. Funeral Services 6 pm Thursday, April 30, 2009 from the funeral home to St. Mary�s Church for Mass at 6:30 pm. Interment St. Mary’s Cemetery. Visitation 3 � 6 pm Thursday at the funeral home. Memorials appreciated.